BUCYRUS — Oh What at Night! is an exciting musical revue conceived and directed by award-winning Broadway director Michael Chapman. It will kick off the Crawford County Community Concert Association on Thursday, Oct. 5. 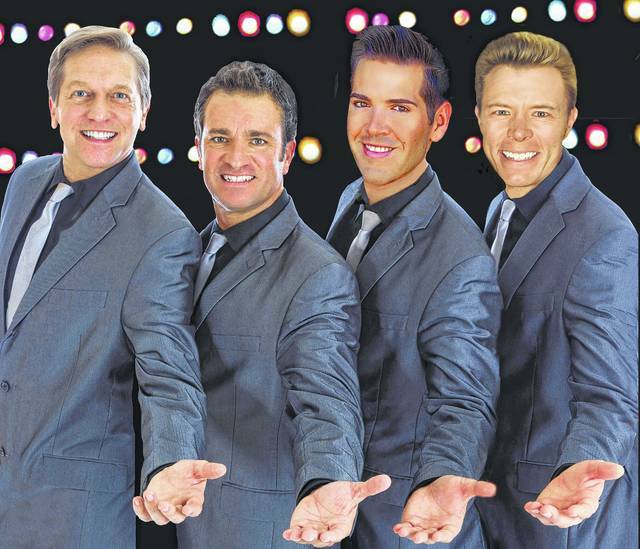 “Sherry,” “Big Girls Don’t Cry,” “Walk Like A Man,” “Can’t Take My Eyes Off You,” and “My Eyes Adored You,” are just some of the many hits you’ll enjoy from the dynamic songbook of those boys from Jersey, Frankie Valli and the Four Seasons. This exhilarating, family-friendly musical revue has been thrilling audiences with great choreography, boundless energy, humor and instantly recognizable classic pop songs that have become timeless. Great seats are still available for this exciting show at 7 p.m. on Thursday, Oct. 5 at the Bucyrus Elementary School Auditorium, 245 Woodlawn Ave., Bucyrus. Doors open at 6:30 p.m.
For additional information, show preview and ticket information go to the “Membership/Tickets” tab on the Concert Association website at: www.crawcocommconcert.com and key on the iTickets.com link or by calling 800-965-9324. There is a student special half price tickets for this show for students 18 years old or younger. Courtesy photo Oh What at Night! will kick off the Crawford County Community Concert Association on Thursday, Oct. 5 in Bucyrus. https://www.galioninquirer.com/wp-content/uploads/sites/38/2017/09/web1_OhWhatANight.jpgCourtesy photo Oh What at Night! will kick off the Crawford County Community Concert Association on Thursday, Oct. 5 in Bucyrus.